Cadiz is located on the Gulf of Cadiz in the southwestern region of Spain about 75 miles south of Seville. The town is a narrow slice of land surrounded by the sea and has a population of about 125,000. Large open public plazas are connected by narrow winding alley like streets. This is also considered to be the oldest continuously inhabited settlement in Europe, founded as Gadir by the Phoenicians about 1100BC. While the city looked very nice, we decided to spend the day on tour in Seville rather than in Cadiz. 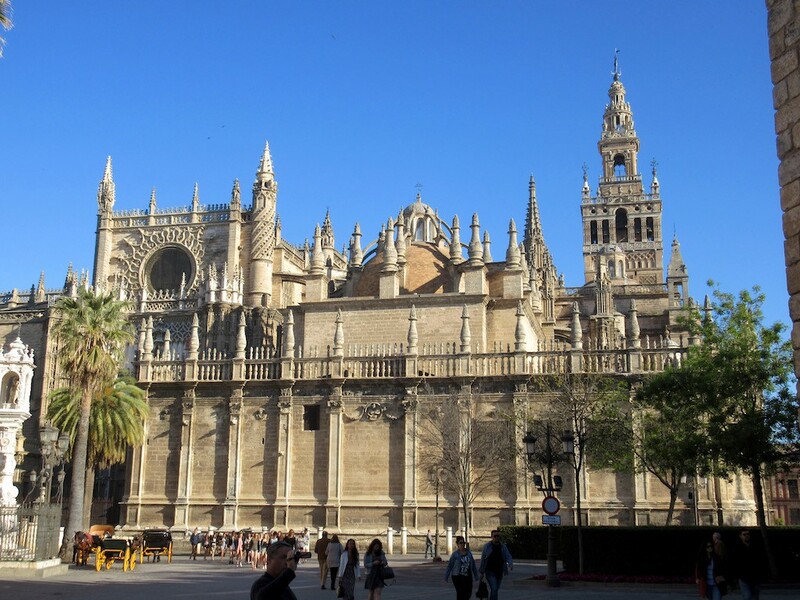 Seville is the fourth largest city in Spain and is a 2,000-year-old metropolis home to countless historical monuments. Seville was once a very important port town accessible by a large navigable river until the river became bogged down with silt and Cadiz became the important seaport. The scenic ride from Cadiz to Seville takes about 90 minutes through beautiful farmland. In this region of Spain they produce more olives and olive oil than they do in all of Italy. They grow cork in this region, a variety of other crops as well as herds of sheep that we spotted along the way. The landscape is mostly flat but very beautiful; mile after mile we saw one field after another planted with one crop or another. 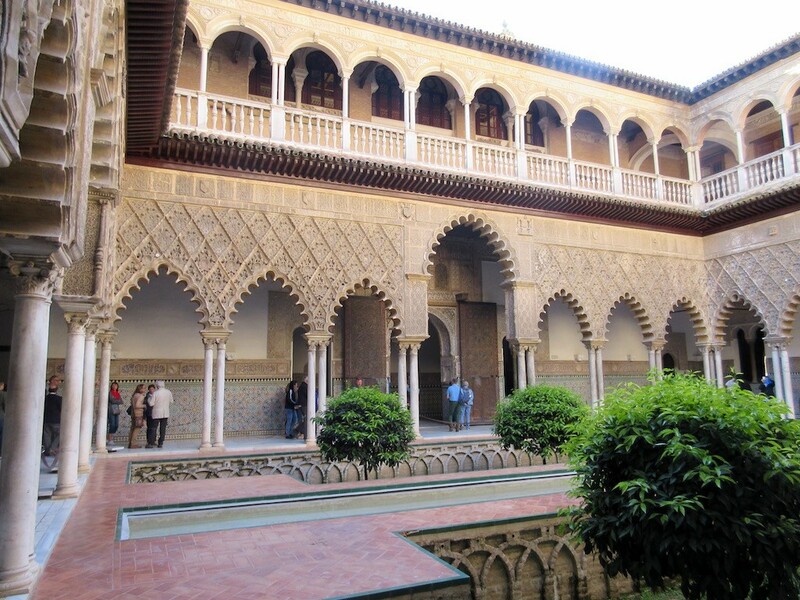 Once we reached Seville, we took a walking tour that began in the Alcazar, a monument to the Moorish occupation of Spain. The Alcazar is the official residence of the King of Spain when he is in Seville. Our guide tells us that he has only slept here for two nights in the last several years. The Alcazar includes room after room of beautiful mosaic tiled walls, elaborate and detailed hand painted plaster reliefs, gorgeous interior courtyards with Moorish arches and colonnades, outdoor gardens with many fountains and—this time of year, sweet blooming orange trees. The rooms that we visited were the public rooms with ornate walls, ceilings and floors but they had no furniture to speak of. Some of these rooms are used for public events and royal weddings from time to time. Our next stop was to explore the old Jewish Quarter next to the Alcazar. At one time the royal family used to protect the Jewish people and so they were located just outside the gates of the Alcazar. Eventually, the Jews were encouraged to leave the area. Over the years most of this area had been rebuilt but the small winding streets here are filled with souvenir shops, hotels and restaurants serving tapas. 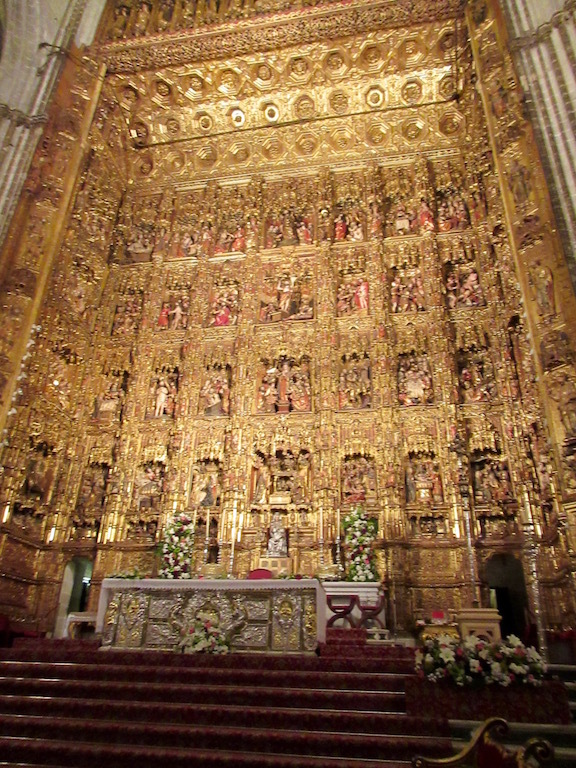 We then visited the grand Seville Cathedral including the tomb of Christopher Columbus. 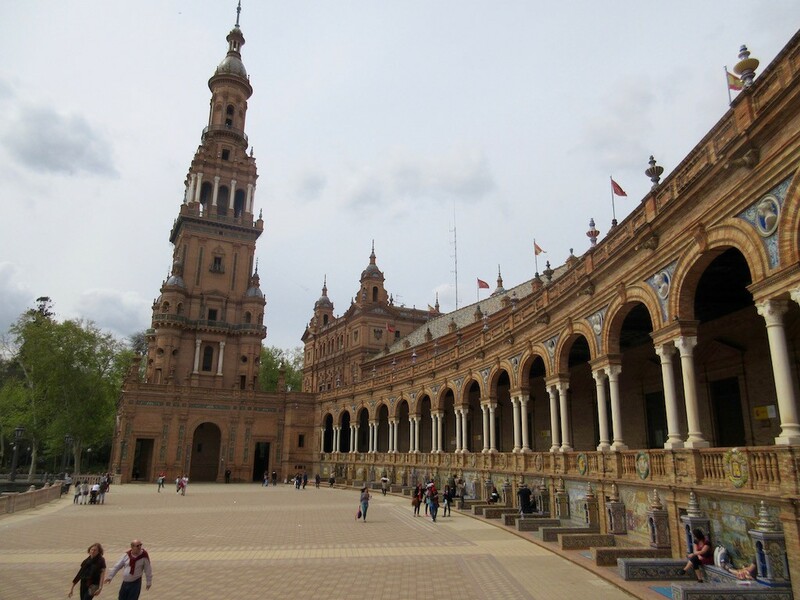 From 1184 to 1198 this was Seville’s main mosque with an enormous minaret built of brick. The original mosque’s courtyard remains today and is called the Orange Tree Courtyard as it is planted with lush green flowering orange trees. The original minaret now forms the lower two-thirds of the Giralda bell tower (325 feet in height). In 1218 the mosque was consecrated as a cathedral. From 1434 to 1517 construction work continued on the gothic cathedral. From 1528 to 1601 during the Renaissance, period the cathedral was expanded and embellished. From the 1600’s to the 1900’s work continued on the cathedral to make it what it is today. The cathedral is now about 425 feet long, 275 feet wide with a transept rising more than 125 feet high and has more than 235,000 square feet of floor space. The cathedral is called the Cathedral of Saint Mary of the Sea today and is magnificent in every way. After St Peter’s and St. Paul’s, it is the third largest cathedral. There are 45 chapels within the cathedral, all ornately decorated with elaborate altars, fantastic paintings, statuary and more. Everywhere you look you find something new and exciting. The main altar is the largest in the world and is made up of a series of niches with hand carved figures telling the stories of the bible. Each of the niches is elaborate on it’s own merit but once they are all put together as one massive altar, imagine that the entire altar is then gilded in gold! The organ is made up of two sets of pipes totaling more than 7,600 pipes. I wish we had more time to explore the cathedral but our time was limited so we only had time to see the most significant points of interest. Our next stop was for lunch at the Macarena Hotel where we had a huge lunch. The starter was a bread roll with prosciutto and cheese followed by a very large salad of lettuce, tomatoes, cucumbers, olives, asparagus and carrots with oil and vinegar for dressing. The entrée was roasted chicken, potatoes and a Spanish rice dish with assorted seafood—a paella-like luncheon. Dessert was three kinds of ice cream with whipped cream on top. The meal was served with a rose wine and water. After lunch we visited a beautiful semi-circular building arcade called the Plaza de Espana, built for a world exposition held in 1929 in Seville. This enormous structure included several large towers, a central water fountain, a moat with boats and arched bridges and ornate painted tile scenes. Today this building is used as government offices. The main street running through Seville is lined with wonderful buildings built for the exposition representing countries all over the world. Today many of these buildings have been converted to residences, offices and museums. Seville is definitely a place to return to explore further. The evening’s entertainment was a Las Vegas Headliner by the name of Tony Pace who performed a show of comedy and music. He had a great voice and did a lot of impersonations of artists from the 1960’s onward.